Geologists classify rocks in three groups, according to the major Earth processes that formed them. The three rock groups are igneous, sedimentary, and metamorphic rocks. Anyone who wishes to collect rocks should become familiar with the characteristics of these three rock groups. Knowing how a geologist classifies rocks is important if you want to transform a random group of rock specimens into a true collection. Igneous rocks are formed from melted rock that has cooled and solidified. When rocks are buried deep within the Earth, they melt because of the high pressure and temperature; the molten rock (called magma) can then flow upward or even be erupted from a volcano onto the Earth's surface. When magma cools slowly, usually at depths of thousands of feet, crystals grow from the molten liquid, and a coarse-grained rock forms. When magma cools rapidly, usually at or near the Earth's surface, the crystals are extremely small, and a fine-grained rock results. A wide variety of rocks are formed by different cooling rates and different chemical compositions of the original magma. Obsidian (volcanic glass), granite, basalt, and andesite porphyry are four of the many types of igneous rock. Sedimentary rocks are formed at the surface of the Earth, either in water or on land. They are layered accumulations of sediments-fragments of rocks, minerals, or animal or plant material. Temperatures and pressures are low at the Earth's surface, and sedimentary rocks show this fact by their appearance and the minerals they contain. Most sedimentary rocks become cemented together by minerals and chemicals or are held together by electrical attraction; some, however, remain loose and unconsolidated. The layers are normally parallel or nearly parallel to the Earth's surface; if they are at high angles to the surface or are twisted or broken, some kind of Earth movement has occurred since the rock was formed. Sedimentary rocks are forming around us all the time. Sand and gravel on beaches or in river bars look like the sandstone and conglomerate they will become. Compacted and dried mud flats harden into shale. Scuba divers who have seen mud and shells settling on the floors of lagoons find it easy to understand how sedimentary rocks form. Sometimes sedimentary and igneous rocks are subjected to pressures so intense or heat so high that they are completely changed. They become metamorphic rocks, which form while deeply buried within the Earth's crust. The process of metamorphism does not melt the rocks, but instead transforms them into denser, more compact rocks. New minerals are created either by rearrangement of mineral components or by reactions with fluids that enter the rocks. Some kinds of metamorphic rocks--granite gneiss and biotite schist are two examples--are strongly banded or foliated. 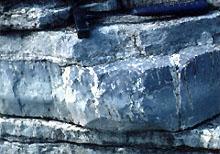 (Foliated means the parallel arrangement of certain mineral grains that gives the rock a striped appearance.) Pressure or temperature can even change previously metamorphosed rocks into new types. Rock-forming and rock-destroying processes have been active for billions of years. Today, in the Guadalupe Mountains of western Texas, one can stand on limestone, a sedimentary rock, that was a coral reef in a tropical sea about 250 million years ago. In Vermont's Green Mountains one can see schist, a metamorphic rock, that was once mud in a shallow sea. Half Dome in Yosemite Valley, Calif., which now stands nearly 8,800 feet above sea level, is composed of quartz monzonite, an igneous rock that solidified several thousand feet within the Earth. In a simple rock collection of a few dozen samples, one can capture an enormous sweep of the history of our planet and the processes that formed it.